Do you know your true labor & materials costs? Could you lower costs by outsourcing your production? Does it make sense to haul your waste factor across the entire country? Financially, is it smarter to utilize the capital investments of another company? 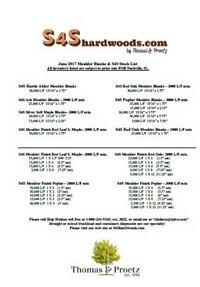 S4SHardwoods.com by Thomas & Proetz provides first-class Precision Hardwood Moulder Blank solutions. We are your source for S4S Blanks, Cabinet Face Frame, Cabinet Door Parts, and Turning Squares. Our solution includes the highest quality Hardwood Products. It lowers your labor costs. It’s exactly to your hardwood ripping specifications. It’s on time. Processed utilizing the “Gold Standard” in optimizing machinery. Our “Architectural Grade” Clear 1Face 2 Edge and “Contractor Grade” Product of the Grade fit any project or ongoing program requirement. A wide range of widths in moulder blanks for Profiles, S4S and Cabinet Face-Frame. A more profitable plan of action. Complete order management & fulfillment. Packaging to their specifications; package sizing, preferred banding, length separation, & protection wrap. S4Shardwoods.com by Thomas & Proetz for all your S4S needs! CONTACT US!